Some people are not waiting to see what Obama will do as president before acting. 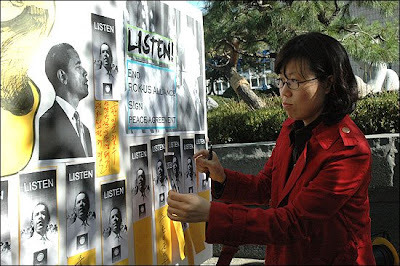 In South Korea activists are now meeting and publicly calling on president-elect Obama to end the dangerous and costly U.S.-South Korea (ROK) military alliance that is contributing to major tensions in the region. The U.S. is currently doubling its military presence in the Asian-Pacific region. New and expanded Pentagon bases are going into Guam, Australia, Japan, and South Korea. "Missile defense" is being peddled to Australia, Japan, and South Korea which is forcing China, who today only has 20 nuclear missiles capable of hitting the west coast of the U.S., to produce more for fear that a U.S. "first-strike" could knock out their nuclear capability. In fact the U.S. Space Command has been war gaming such a first-strike attack on China for the past several years! If Obama wants to reduce global tensions he should begin negotiating a de-escalation of militarism in the Asian-Pacific region. If Obama wants money for health care, education, energy policy, and new jobs at home then he must stop expanding U.S. military bases in that region and throughout the world. Activists from Solidarity for Peace & Reunification of Korea (SPARK) in South Korea have it right. Make demands on Obama now, before he sets his foreign and military policy in stone. We in the U.S. have much to learn from our friends in South Korea. The Global Network has been invited to hold its 2009 space organizing conference in South Korea on April 16-18. 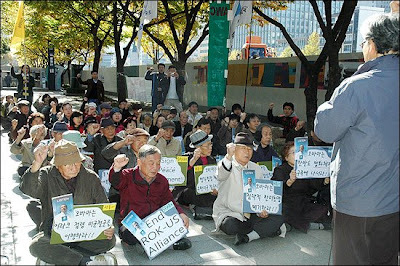 Several key peace groups in South Korea will host the conference and we hope we can all celebrate the cancellation of the U.S.-ROK military alliance. We hope to raise our glasses to toast a new U.S.-ROK and U.S.-Asian Peace Alliance in place of the antiquated war making venture that now dominates our national agendas. Last night I drove south to Biddeford, Maine to do a taping of an hour long public access TV program called "Out in left field." Today I did a half-hour radio interview that plays on a couple stations in Connecticut. In both cases the questions were the same? What is Obama going to do? Is he going to stand up to the military industrial complex? Will Obama be able to deliver on his promises of change on health care, education, energy policy and more? Everyone is asking and no one knows for sure just yet what will happen. One story I heard last night was that someone said to one of my friends, "Obama is for hope." What does that mean the person was asked. "Anything you want it to" was the response. So there we go....what do you think? Obama has not even been sworn into office yet and already the sparks are flying across the Atlantic. The BBC reported on November 8 that Polish President Lech Kaczynski said in a statement published on his website that during a phone call with Mr. Obama the president-elect had "emphasised the importance of the strategic partnership of Poland and the U.S. and expressed hope in the continuation of political and military co-operation between our countries." "He also said that the missile defence project [Bush's plan to deploy U.S. interceptor missiles in Poland] would continue," the statement added. During his campaign Obama had said otherwise. Then, the same day, the BBC published a second article quoting an Obama spokesperson saying, "U.S. President-elect Barack Obama has not given a commitment to go ahead with plans to build part of a U.S. missile defence system in Poland." When asked about the declaration, Obama foreign policy adviser, Denis McDonough said that the president-elect had "a good conversation" with Mr. Kaczynski about the American-Polish alliance and discussed missile defence, but "made no commitment on it". "His position is as it was throughout the campaign, that he supports deploying a missile defence system when the technology is proved to be workable," Mr. McDonough said. OK, are you just a bit confused? I am. Someone is speaking with a forked tongue. Is it Polish President Lech Kaczynski who is telling a tall tale? Why would he, after his first conversation with Obama, lie to the world about their talk? That would constitute getting off to a very bad start with the new U.S. president which I would imagine is not something the Polish government would want to do. I would venture to guess Kaczynski was excited about the conversation and wanted to share it with the whole world that Obama had changed his mind on the deployment issue. On Obama's part I can imagine he might have figured their conversation was private and "off the record." But when it suddenly was splashed across the world via the BBC that Obama had changed his position the embarrassment was too much and a denial had to be immediately issued. So who was telling the fib? What it indicates to me, if it turns out to be true that Obama had changed his mind, is that the new president cannot be trusted to really buck the military industrial complex. 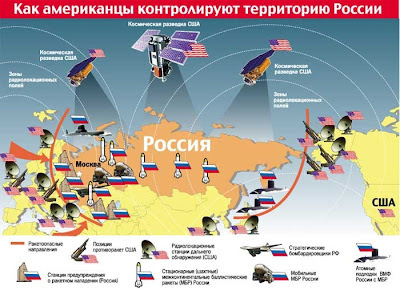 The deployment of "missile defense" interceptors in Poland and the Star Wars radar in the Czech Republic, aimed at Russia, stand to create a new arms race in Europe. If Obama is willing to take that step then we are in big trouble for sure. Don't waste a minute. Letters from outside the U.S. to Obama on this subject are highly encouraged.